Using the theory of a few zealous IT specialists, the Syndicate’s army made a breathtaking discovery: by hacking the alien civilization’s information system – reminiscent of the internet –, it could “infect” it and take over control of a couple of devices. The actual break-in was accomplished with tiny robots similar to space probes. 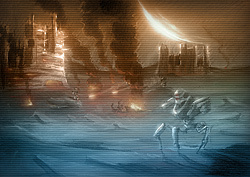 The fleet of nanorobots took control of three local military bases, along with their respective robot arsenals. With the help of the small army taken by trickery, we managed to obtain command over a large area, where we conquered factories and laboratories enabling the Syndicate to begin the production of further supplies of robots using stolen prototypes. The success of the invasion plan lay evidently in the element of surprise. Beause the aliens have prepared themselves for another breach of their network, our conquest can only be continued using a local regular army. The expansion is further facilitated by the long-standing war between certain groups within the alien species. By applying the principle “divide and rule”, the earthly forces have so far been successful in playing off the war parties against each other. Colonization is an extremely complicated process that can only be commanded by highly skilled and trained persons. The corporations operate academies to train their Agents, whose exceptional physical and intellectual skills make them fit for this job. By the end of the training, they become experts in military and natural sciences, information technology and economics, while also receiving comprehensive and challenging combat training. The bases occupied on Nia are controlled by the Syndicate shareholders and order is maintained by the organization’s joint forces. The tradesmen, soldiers and bureaucrats live in a society of specific hierarchy. The Agents have a wide range of responsibilities: assisting military expansion, furthering the occupied infrastructure on the planet, and performing other logistic tasks. The Agents are so highly trained that they can perform risky, professionally challenging tasks almost entirely up to their discretion. However, the training of Agents is a very long and costly process. Those who fit the strict criteria and genuinely wish to work for the Project Perpetuum have to join the infrastructure of the organization. Their job is to control the colonies that lie 87,000 light-years away. Even though they sense their every action as virtual, they are all real. At the end of the training, a special chipset is inserted surgically into the Agent's central neural system - a process called neurointegration. This chipset is required to communicate with their “Sparkle” (or “Spark”), which is a remote controlled nanorobot obeying the Agent’s orders on Nia. Both neurointegration and the remote controlled colonization are strictly supervised processes by the Megacorporations for a reason: they have no intentions of sharing financial and technological gains. The Syndicate denies the information that the Earth-Nia connection can be cracked and some Agents are connecting to the Perpetuum Project this way to avoid local authorities and to gain independence from the Syndicate. The Project run by the three corporate giants is certainly the greatest enterprise of humankind. At first, the Syndicate had reservations about sponsoring research of the wormhole. When the first great results were achieved, the Project’s research team received more attention and increasing capital investments. The gradual reshaping of goals is clearly represented by the composition of the expert team. The mapping of remote star systems first engaged physicists and engineers, but after the discovery of the alien civilization, military and intelligence forces entered and claimed their place in running the Project. The unified body controlling the expansion, Project Perpetuum, did not gain its final form until recently, at the end of 2194. The headquarters of the Project, a space station orbiting around Earth, was finished in the same year. This is where the Syndicate holds its meetings and this is where the Agents access Nia’s information network. All the energy produced on Nia comes here and is distributed from here. Despite the importance of military forces, managing the colonization is like a free investment, rather than a coordinated invasion. The management of the corporate giants is not directly involved in what happens; it outsources professional tasks to its specialized affiliates. The trained Agents are employed by these affiliates, and receive their missions directly from the department heads. Engaged in the Project, the Agents’ main goal is to transfer as much energy to the Earth as possible, using the energy producing technology of the aliens. The constellation Sagittarius that is in the home of the Project has a double meaning. On one hand, it symbolizes the eternal war that interweaves human history; on the other hand, Nia is located in the globular cluster M54 that is part of the constellation Sagittarius.